Our Planting Party was a tremendous success! We had beautiful weather and great participation by volunteers and Refuge staff. Thanks to all the hard workers, we’ve made a big leap forward, and the garden is really taking shape. It would have been easiest to get rid of everything inside the fence and start fresh. However, there were many desirable plants in there, so the decision was made to manually remove invasives and other undesirables, leaving the rest. On the work day, some people planted, while others dug out and pulled up the plants that were not wanted. Refuge staff and volunteers working together can accomplish so much! There were staff members there from every department, including Refuge Manager Joe Saenz. FAMI board members Ellen Reisinger and Linda Frank, designers of the garden, organized and led the work party. A great deal was accomplished in far less time that we expected! After the work was done, we adjourned to a hamburger & hot dog lunch and social gathering in the Commons. It was a great opportunity for all of us to get to know one another a bit better. We still have a lot of work to do, but it’s wonderful to have a lot of the plants in and be able to have a good preview of what the completed product will look like. If you would like to be involved in future work days, please email info@friendsofaransas.org. Thank you to everyone that participated. Special thanks to Linda Swiggett, Gay Hejtmancik, Jim Schreiner, Linda Frank, & Ellen Reisinger for preparing the food, and to Ellen Reisinger & Linda Frank for coming up with the idea for lunch. To see more photos, go to our gallery. 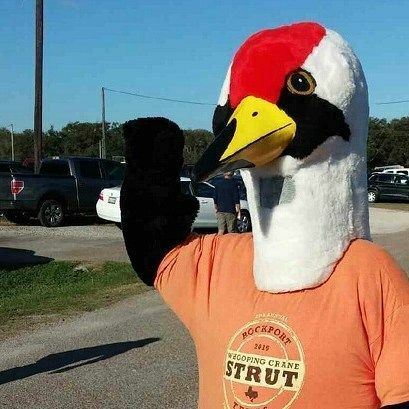 The Rockport, TX, Whooping Crane Strut was held Saturday, March 12, and we had a fabulous time! The weather was wonderful and turnout was fantastic. The Aransas National Wildlife Refuge Super Whooper was, as always, a huge crowd pleaser. Super Whooper, assisted by Jim Panaccione, USFWS, gave the signal to start the race, cheered racers in, handed out door prizes, and posed for photos with fans of all ages. A portion of each entry fee will be donated to our Water for Wildlife Fund. The final figures aren't available yet, but it will be a healthy addition to our fund. Thank you to the City of Rockport, and everyone that participated! You can see more photos from the event in our Whooping Crane Strut photo album. 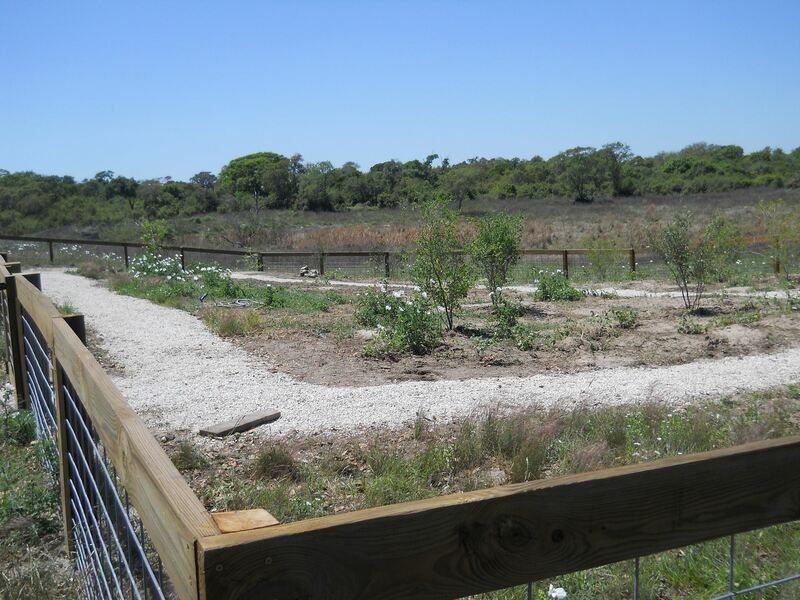 Vote for Aransas National Wildlife Refuge! Aransas NWR has been nominated in the USA Today 10 Best Places for Birding poll. Please vote for our Refuge and ask your friends and family to vote. After you click on the link & vote, be sure you get a "thank you for voting" message. You can vote every day until noon, March 28. Help us let the world know what a great place Aransas National Wildlife Refuge is! 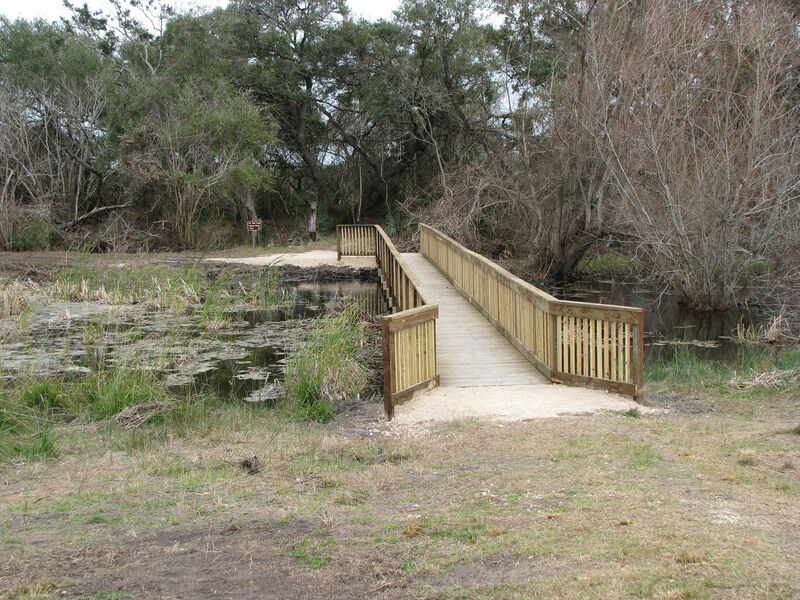 Not only is the new Rail Trail bridge now open, but Rail Trail is longer! The north section has been extended to the refuge fence. In the first photo, Fred Lanoue is standing at what used to be the north end of Rail Trail. In the second, Linda Lanoue is at the new end of the trail. 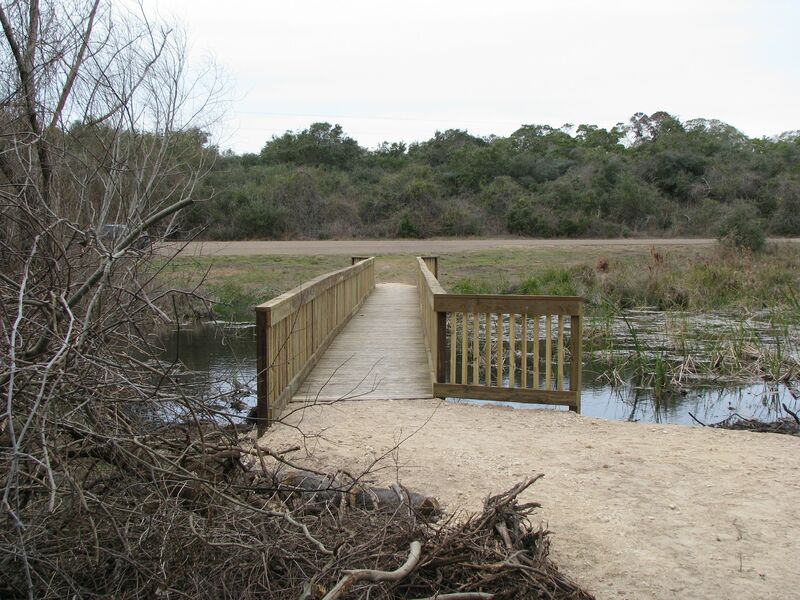 Thank you to Aransas NWR maintenance staff & volunteers for giving us more Rail Trail! The FAMI annual Membership Meeting was held Saturday, January 30th, with 38 members attending. Although Refuge Manager Joe Saenz was unable to attend, Laura Bonneau, Visitor Services Manager, read a message from him, and gave us a refuge update. Keith Westlake, Lead Biologist, gave us an update on what's going on with Biological Services and Wade Harrell, USFWS Whooping Crane Coordinator, gave an update on the flock. Board Members for 2016 will be Fred Lanoue, President; Amanda Rocha, Secretary; Linda Lanoue, Treasurer; and Directors at Large Linda Frank, Ellen Reisinger, Irma Schreiner, & Linda Swiggett . You can read more about them at Meet the Board. Our speaker was Lee Ann Johnson Linam, whose father was Frank Johnson, a Refuge Manager at Aransas NWR. Lee Ann grew up on National Wildlife Refuges, including Aransas, before going on to become a biologist with Texas Parks & Wildlife. She gave us a fascinating look at life on the refuge, and her father's work with Whooping Cranes & other wildlife. Lee Ann herself developed citizen science programs for monitoring endangered species, including the Whooper Watch program. Her program was both informative and entertaining. Lee Ann also assisted us by drawing for door prizes. There were several items donated by the Nature Store: Monarch lapel pins, Jabebo earrings, 2 different designs of canvas bags, and a cap with a brand new Friends of Aransas design, not previously sold. We also had prizes donated by Captain Tommy Moore & Rockport Birding & Kayak Adventures. Captain Tommy donated 4 beautiful T-shirts, and 3 birding trips for 2 on the Skimmer. The lucky winners of the trips were Sue Weir, Barbara Bruns, and Fred Krebs. We really appreciate Captain Tommy's support. Every member attending received a reusable water bottle from the Nature Store. Lunch was chicken spaghetti with salad & fresh fruit, plus a marvelous array of desserts. After lunch, those that wished were led on a tour to Burgentine Lake, a non-public section of the refuge, by Keith Westlake, Wade Harrell & Laura Bonneau. It was wonderful to have a chance to visit with members, from several that have been members for many years, to a couple that joined just a few minutes before the meeting. We are all excited by the many positive things going on at the refuge. To see photos of the meeting, visit our Gallery. Dr. Wade Harrell will present a program on Whooping Cranes on February 18th, at 5:30, at the Coastal Bend Museum in Victoria, TX. Admission is "pay-what-you-want". For more information, see their website. 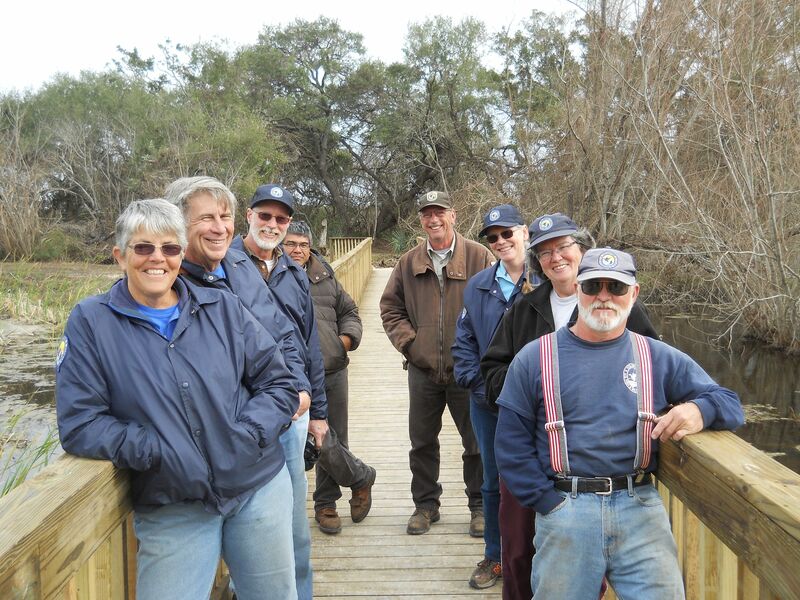 Thanks to this awesome crew, the bridge linking Rail Trail to the road is now open! Come check it out! More news about Rail Trail coming soon. If you missed our Early Bird New Year's Celebration, you missed a good time! We celebrated the Refuge's 78th birthday & our love of Whooping Cranes, as well as getting an early start on New Year's. Richard Gonzales explained what the Science & Spanish Club Network is, and told us of some of their accomplishments. FAMI President Fred Lanoue gave a brief overview of Friends of Aransas NWR & invited attendees to visit our Nature Store. Jennifer Brown, Environmental Education Specialist then gave a "State of the Cranes" address. To get everyone in a party spirit, our Super Whooper danced to the Whoop song & then posed for photo ops. You can see a video here. We then counted down to noon for our early New Year's. After that, we sang Happy Birthday to the Refuge & attendees blew out the candles on the cake. Thank you to Richard Gonzales and the Science & Spanish Club Network for donating the punch and decorations. Also on display was a door decoration created by the 6th Grade Science students at Blaschke Sheldon Elemetary School in Ingleside, taught by Robin Flures. 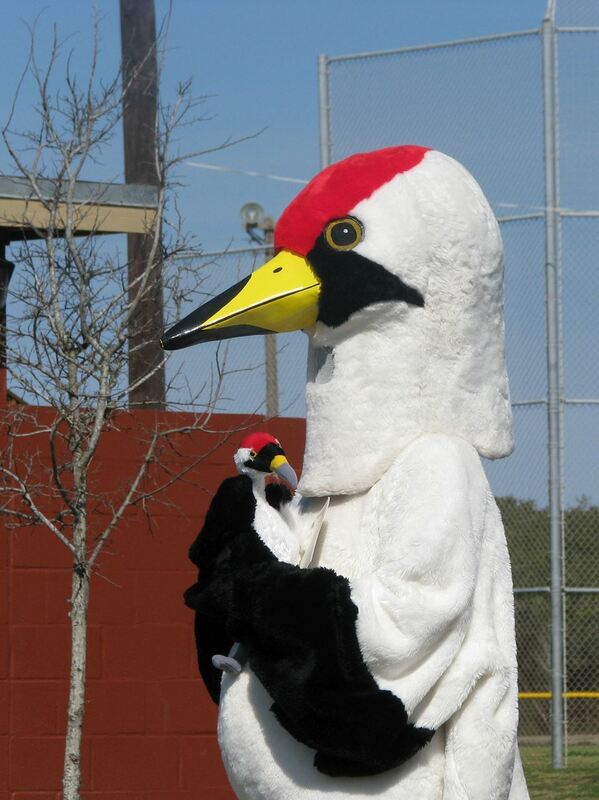 It's a beautiful life size "Winter Texan" Whooping Crane. It was donated to the Refuge by the students and the Science & Spanish Club Network. After everyone had cake & punch, the best plumage (white, black & red) was chosen. The winner, chosen by the crowd, was 21 month old Idalia Raschke. You can see more photos by clicking on our Gallery. Click on the image to see it bigger. Whoop It Up Early Bird New Year's! We are partnering with Aransas National Wildlife Refuge and the Science & Spanish Club Network to Whoop It Up at the Refuge December 31. We have a lot to celebrate. It's the Refuge's 78th birthday! It's New Year's Eve! The Whooping Cranes are here! WHOOP! WHOOP! Be at the Refuge Visitor Center by 11:00 a.m. 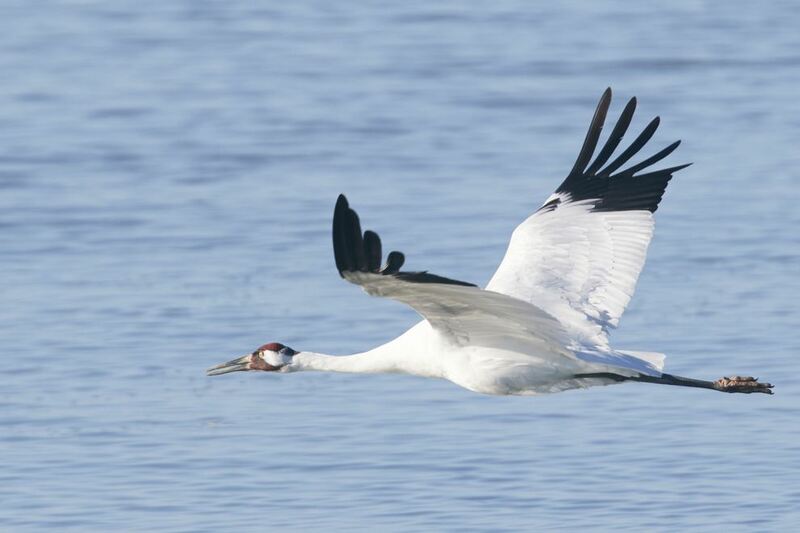 If you'd like, honor the Whooping Cranes by wearing their colors, red, black & white. There will be a prize awarded for the best crane plumage. We'll hear a brief talk about Whooping Cranes, and get a head start on New Year's by counting down to noon. Our Super Whooper mascot will lead us in dancing the Whoop Song, followed by birthday cake and photo ops. You can hear the song & practice by visiting our Facebook page. For more information, you can call the Refuge at 361-286-3559 & ask for Jennifer, or email her. Don’t forget about the Aransas (TXAR-2015-#65) Christmas Bird Count on December 22. Paul Swacina is the coordinator and is still putting together teams. All birders, from beginners to expert, are invited. Contact Paul to get on his list. Be sure to let him know your level of birding experience, as well as familiarity with the Refuge, so he can assign you to an appropriate team. Coffee, pastries, and lunch fixings will be provided, sponsored by Friends of Aransas NWR. The Nature Store will be open that day, allowing count participants a chance to do last minute Christmas shopping. The store has some great new merchandise for all ages, and all profits are used to support the Refuge. “Hopper’s Landing is located just up the road from the refuge and has been closely connected to ANWR since the refuge’s founding. “The famous Audubon researcher Robert Porter Allen during his seminal research on both Roseate Spoonbills and Whooping Cranes stayed at a cabin at Hopper’s landing (which is still there) and relates many fine stories of Butch’s grandpa and father in his numerous books and reports. “Adela was an active volunteer at the Refuge in the past and has many fond memories from her years there. “There are cabins and RV places to stay at either the day before the count or the night of the after party, reservation are suggested. “The Jerry James Band will be providing live music from 7:00 p.m. – till 10:00 p.m. He also performs regularly in Victoria Texas at Greek’s 205. Jerry is recently retired from the City of Victoria where he was the Environmental Services Director." Be sure to contact Paul for more information.